Sarah came over to bake these soufflés with me, which definitely helped get everything done faster! The basic components here are: béchamel, a pile of cheese and produce, and meringue. Let’s get to it. Mise en place. Prep your ingredients before doing anything else. I shredded the emmenthaler and half of the monster zucchini a day ahead of time, as well as chopping the chile. 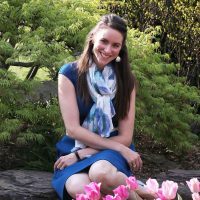 Then, before Sarah and I got started cooking, we separated eggs, grabbed the herbs we needed from my garden and washed them, and pinched the stamen out of the center of the delicate blossoms. Salt the zucchini liberally and leave it to drain in a large colander lined with a cheesecloth. This will force the zucchini to sweat, or release its liquid. After about 15 minutes, squeeze the zucchini dry. We wrapped up the shreds in the cheesecloth and wrung it thoroughly, but working in batches with your bare hands is also fine! Just make sure to squeeze out as much moisture as humanly possible, because wet zucchini will affect the texture and cook time of the soufflé. 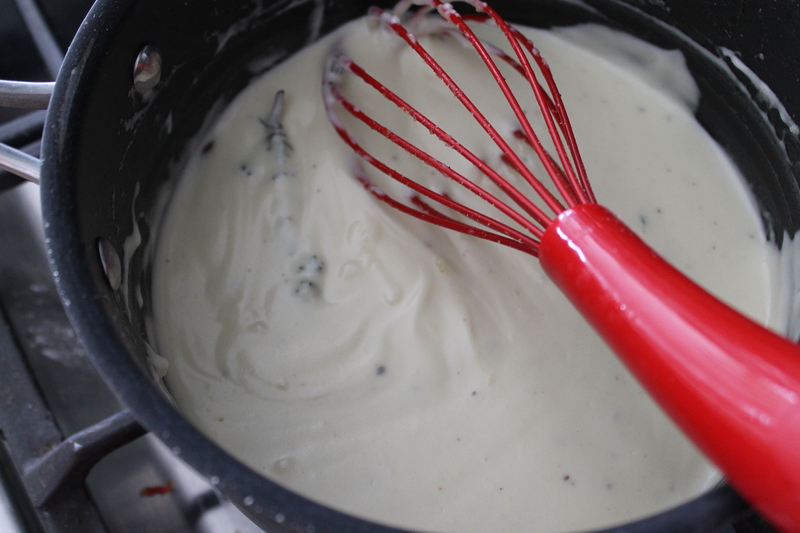 Make a béchamel, or a white sauce. First, melt butter over medium heat. Whisk in an equal amount of flour, working quickly so the flour and butter form an even roux with no lumps. Slowly pour in half-and-half, whisking constantly so the sauce doesn’t become lumpy. It will bubble and become quite thick, like mashed potatoes, and then eventually thin out into a soupy mixture. Toss the thyme sprig and bay leaf into the béchamel, along with fresh grated nutmeg and a light seasoning of salt and black pepper. Stir over low heat, until the sauce thickens about 15 minutes. If necessary, for example, if your béchamel thickens surprisingly quickly, add a bit of extra milk to thin it back out and keep it from become gelatinous. After 15 minutes, discard the thyme and bay leaf and remove the béchamel from the heat. 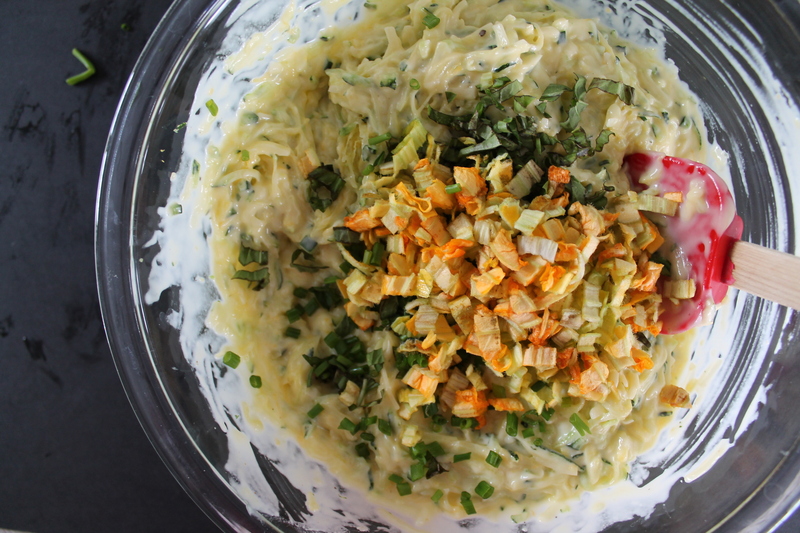 Whisk the yolks into the béchamel, followed by the wrung zucchini shreds, cheese, and chile. 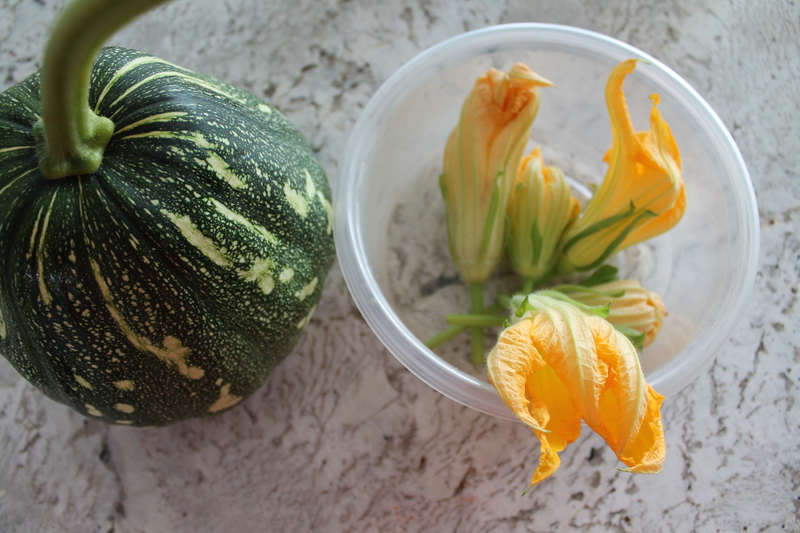 Slice or tear the squash blossoms into small pieces and add these along with the herbs to the sauce. In a large bowl, beat the egg whites until a stiff, but not dry, meringue forms. Fold one-quarter of the meringue into the squash mixture to lighten it, then fold in the rest. Add a bit more salt and black pepper, to taste (we added about a half teaspoon of salt and a grind or two of pepper). Grab eight small (8oz.) ramekins. Butter them thoroughly and place them on a baking sheet. Spoon a heaping half cup of soufflé mixture into each ramekin. Bake for 10 minutes at 400°, then reduce the heat to 350° and bake another 15 minutes. The tops of the soufflés should be golden, and if you gently touch the center of one of the soufflés, it should be set and slightly springy, rather than leaving an indentation or falling completely. Serve the soufflés immediately. They will be incredibly hot, and they will shrink slightly as they cool. Thoroughly butter eight 8oz. ramekins and set them aside. 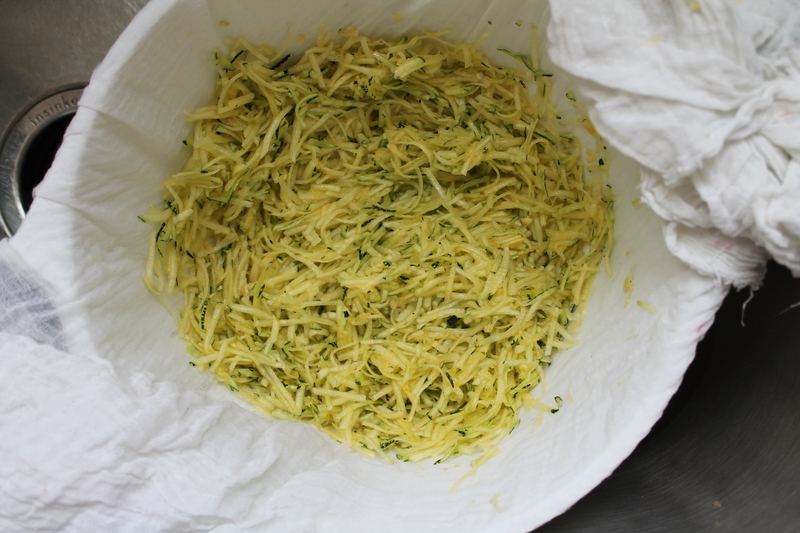 Place the shredded zucchini in a cheesecloth or fine mesh strainer. Liberally season with salt and let it sweat for 15 minutes. Meanwhile, in a large saucepan, melt the butter over medium heat. Whisk in the flour and cook for 1 minute. Slowly stream in the half-and-half, while whisking constantly to keep the texture uniform. When all of the liquid has been added, and the sauce is thin and liquidy, add the thyme sprig, bay leaf, cayene, nutmeg, and a few pinches of salt and black pepper to the pot. Stir over very low heat until the sauce thickens, about 15 minutes. If the sauce starts to become too thick, add an extra splash or two of half-and-half to keep it soft and smooth. Discard the thyme and bay leaf. Wrap the zucchini up in the cheesecloth and wring it until it is completely dried out and no more liquid can be released. Whisk the egg yolks into the béchamel. Stir in the dried-out zucchini shreds, shredded cheese, chile, and fresh herbs. Gently slice or tear the squash blossoms into small pieces and fold them into the squash mixture. In a mixer bowl, beat the egg whites until they form a stiff, opaque meringue. Fold one-quarter of the meringue into the squash mixture to lighten it. Gently fold in the remaining meringue, working it all into the batter without deflating it. Season the soufflé mixture with salt and black pepper, to taste. 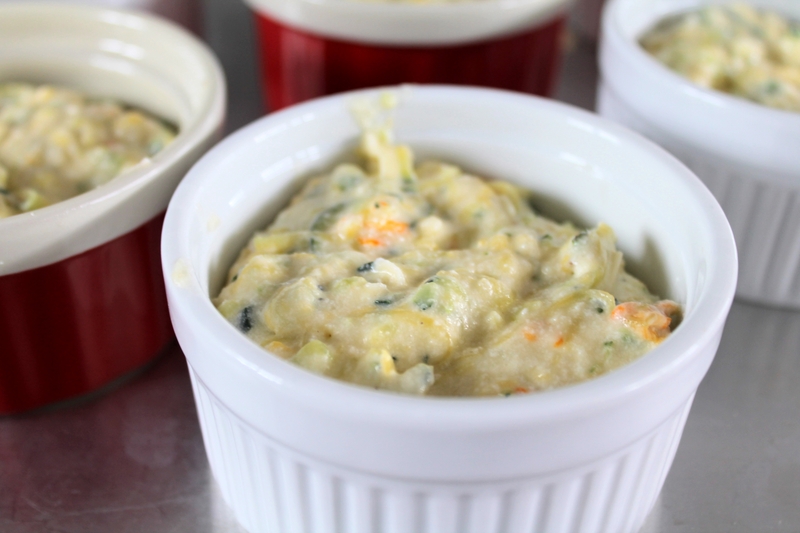 Scoop a mounded half cup soufflé mixture into each buttered ramekin. 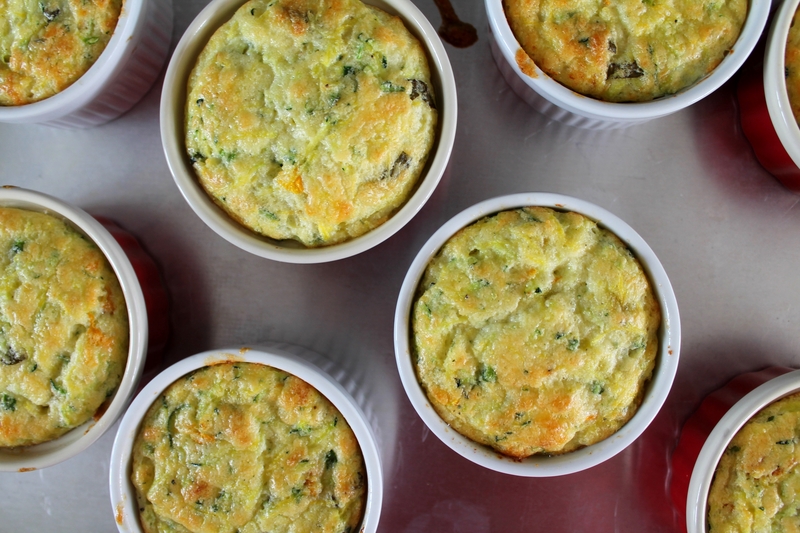 Place the ramekins on a baking sheet. 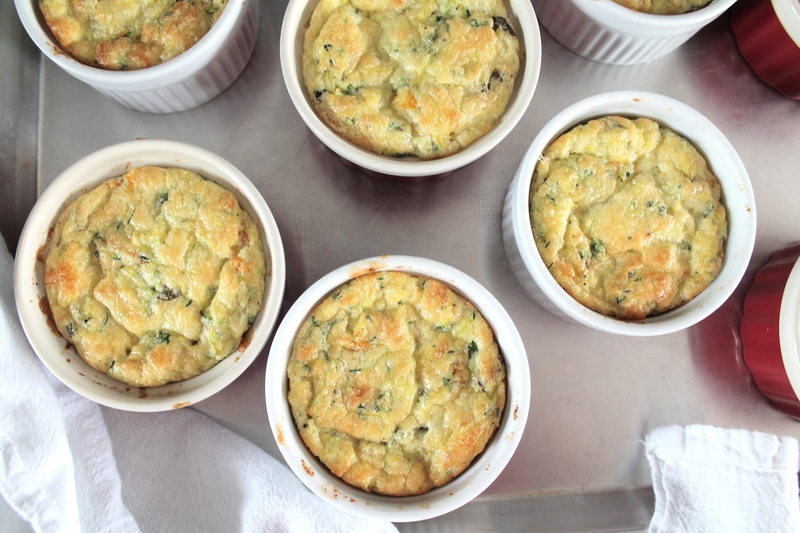 Bake the soufflés for 10 minutes. Reduce the oven heat to 350° and rotate the baking sheet. Continue baking another 15 minutes, or until the tops of the soufflés are puffed and golden, and the centers are barely springy. 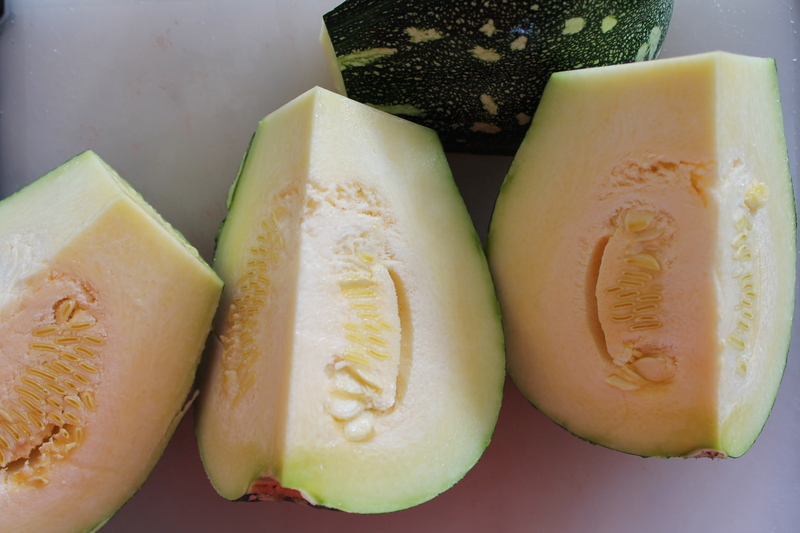 Serve immediately, garnished with extra herbs and extra squash blossoms if desired. 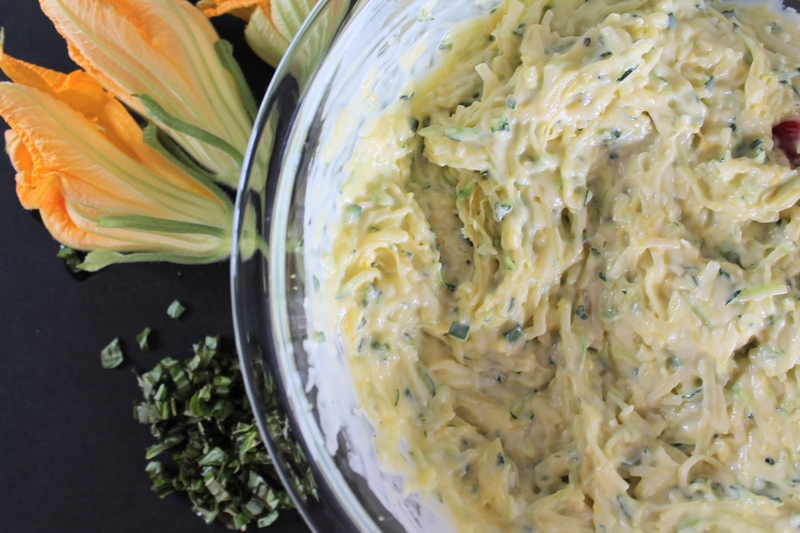 Love Zucchini Blossoms…the souffles look delicious!! !